Featured paper: Phonons coupled to magnetic order in the origin of ferroelectricity. 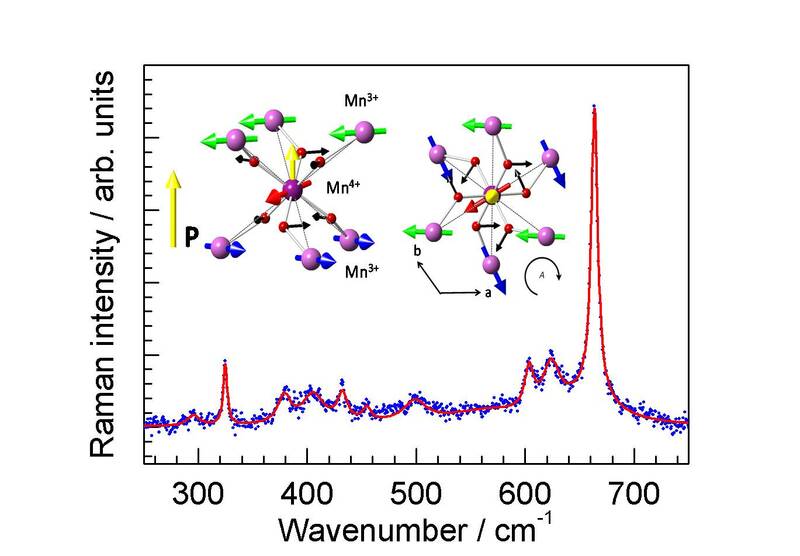 Paper: Spin-phonon and magnetostriction phenomena in CaMn7O12 helimagnet probed by Raman spectroscopy. Nonato, A.; Araujo, B.S. ; Ayala, AP; Maciel, AP; Yanez-Vilar, S.; Sanchez-Andujar, M.; Senaris-Rodriguez, MA; Paschoal, CWA. Applied Physics Letters 105, 222902 (2014); DOI: 10.1063/1.4902234. Through a study based, mainly, on the technique of Raman spectroscopy, resarchers from Brazil, in collaboration with scientists from Spain, progressed in the understanding of the mechanisms involved in the generation of magnetically induced ferroelectricity (electric polarization that occurs in some materials with spiral magnetic order, even when they are not under the action of electric fields) in the CMO compound. CMO, which formula is CaMn7O12, is a ceramic oxide of perovskite structure that presents, simultaneously, at low temperatures, ferroelectricity and anti-ferromagnetism. In addition to contribute to the advance of fundamental science, the work, which results were recently published in Applied Physics Letters (APL) journal, opens possibilities to the creation of new materials which polarization may be controlled through magnetic fields. Such materials could be applied, for example, in new spintronic devices for data storage, faster and that consume less energy. The study was performed during Ariel Nonato Almeida de Abreu Silva’s PhD research work, advised by Carlos William de Araujo Paschoal, Professor at the Physics department of the Brazilian Federal University of Maranhão (UFMA), where he leads a research group in dielectric and vibrational properties. “The idea arose out of the search for multiferroic and magnetoelectric materials that allow for a control of the electric polarization upon replacements”, says professor Araujo Paschoal, who signs the article together with other seven researchers. According to him, CMO was chosen because it presents a rich diagram of phases (magnetic, structural, and charge order), and because it is unique in the mechanisms that generate ferroelectricity from its magnetic properties. Among CMO’s particularities, there is a magnetic transition, which occurs at 90K (around -180°C), where the compound passes from paramagnetic phase to anti-ferromagnetic phase, inducing a giant ferroelectricity. In the study that generated APL’s paper, Ariel and his advisor analyzed in details the Raman spectra of CMO samples at several temperatures (from 300 K to 10K) to investigate the collective vibrations of the atoms of the crystalline lattice (phonons) and their relation with magnetic order. Among other results, they were able to prove that, at 90 K, the phonons showed an unusual behavior due to the coupling to magnetic order. “The main contribution of this work is to help in the understanding of how the phonons couple to the magnetic order in CaMn7O12(CMO). It is, with no doubt, a great step that allows us to progress in the understanding of the origin of the induced electric polarization in CMO, which is also a subject of great discussion in literature”, affirms Paschoal. Raman spectrum of CMO at 10 K. The inset shows the ferroaxial coupling of the magnetic helix with the global rotation of the structure described by the axial vector A. The experimental work of this study started with the synthesis of the samples, which was done at Universidad de A Coruña (Spain), where Ariel was performing a doctoral fellowship period under the supervision of Professor Maria Antonia Señaris Rodriguez. After that, at Universidad de Santiago de Compostela, a series of magnetic measures was performed. Finally, the Raman spectroscopy measures were carried out in the Laboratory of Light Scattering at the Federal University of Ceará, in cooperation with professor Alejandro Pedro Ayala, and in the Physics department of UFMA itself, in the Laboratory of Vibrational Spectroscopy and Impedance (LEVI). The work was funded by Brazilian federal agencies (CNPq and CAPES) and state agencies (FUNCAP e FAPEMA, from Ceará and Maranhão states, respectively), and by entities from Europe.